How to play the maps.. Excuse me for my noobness about to come. So i have the SCII Beta and i downloaded the sunken defense map. How exactly do I play this? I have it loaded in the Map editor but that's it. And if i were to want to play this with another friend would I need to use that mapcraft program? Thanks! Yes, to play it singleplayer, you need to put it in the editor and hit: Test Document. 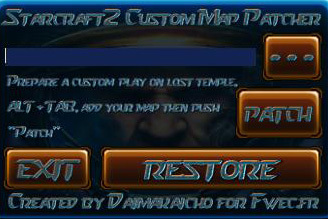 Then to play with a friend, use one of the various Custom Map Patchers. Both of you have to have the map, and use the Patcher for it to work. I hope this helps. Oh yea, here's an achievement for joining SC2Mapster. Awesome thanks for the achievement :) which patcher would you recommend? Well, I have only used the . And I like it a lot! Cool, mind linking me to it?